I’m often asked about the fonts we choose for various projects, and folks are sometimes surprised when they find out some of my most favorite fonts—the ones I go to over and over again—are fonts digitized by AnnTheGran herself! If you search the www.annthegran.com website for items with the AnnTheGran brand, you’ll find some of the best hidden gems of the embroidery font world! Or to keep it simple, click here to go to the page with all the fonts. As a member of Ann’s Club, members receive 50% off the regular price of these fabulous fonts…the membership quickly pays for itself! 1) Remember these design sets are not “keyboard” fonts---each letter is a separate design file and in order to create a name, you’ll need embroidery software that allows you to combine designs to form the name. 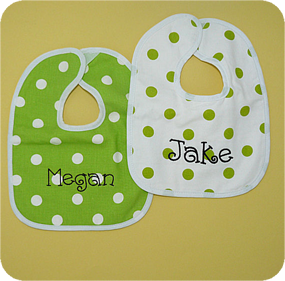 2) In the example above, you’ll notice the name on the bib on the right looks a little darker than the one on the left. I like the font on the left just fine, but I wanted the name to REALLY stand out and be bold, so I backed up the machine to the beginning and restitched the entire design again. This gave the design a “perkiness” to it that I like. I do this with almost all of my monograms now---I like the look of the raised font. It doesn’t mean it’s badly digitized---it just means I like my monograms a little thicker and puffier and I can achieve this affect by simply stitching twice! Most of the gifts you personalize include a name on them, so invest in a good arsenal of your favorite fonts. It will speed up your embroidery process when you know exactly which ones to choose! What a good idea. Thank you. Susan - I love this idea. Without sizing issues or any fuss, you get something a little different.